Three of Graham seven evening events in the Decision America Pacific Northwest tour took place in Oregon, and the remainder in Washington. 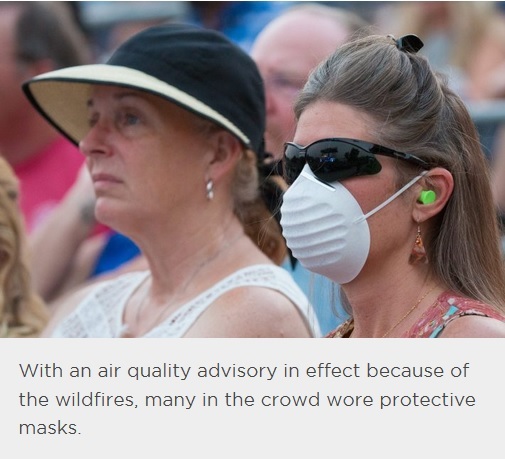 The first Oregon gathering was Wednesday, Aug. 1, at the Jackson County Fairgrounds and Exposition Park in Medford, with an estimated 8,700 attending despite a thick haze in the air due to wildfires in both Oregon and northern California. According to the Medford Mail Tribune newspaper, Graham described himself as “not a politician,” and said he is not involved with either major political party. He said Republicans and Democrats are both incapable of solving the nation’s current divide. and that only God can heal the rift, but that His people must pray. Speaking about the wildfires, Graham said the all-hands-on-deck mentality that was combatting them was an example of how Americans can work together despite their differences. 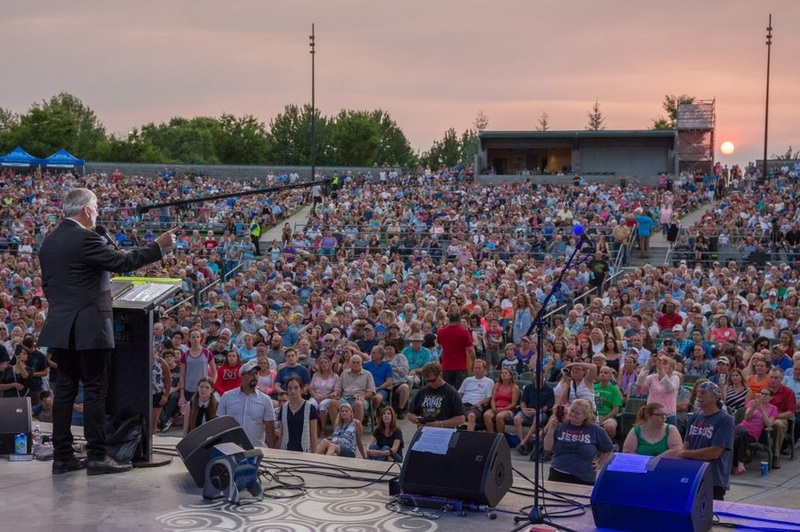 Two days later, Graham moved on to Central Oregon, with an appearance at Christian Life Center’s Life Amphitheater in Bend. Crowd estimate there was 5,100. Graham told the gathering that Jesus Christ is the only true source of beauty, hope and freedom. Focusing on the Old Testament story in Daniel 5 of King Belshazzar’s idolatry and Daniel’s purity, Graham noted that idolatry continues today as modern culture elevates sports, celebrities and relationships over God. But God hates idolatry, Graham emphasized. He called young people today to commit to moral purity. Graham’s Portland-area rally took place on a hot, muggy night Aug. 5 at the Clackamas County Fair and Exposition grounds in Canby. About 12,000 attended. As he did during the other meetings, Graham started by pointing out the political divide in the nation, and said the influence of people of faith is needed in the political process, not only through voting but through those willing to run for office. Graham also took a moment to focus on Oregon’s current leadership, and specifically to pray for Gov. Kate Brown. Graham’s talk in Canby centered on God’s judgment. Graham cited the Old Testament account of Sodom and Gomorrah and the rebellion and arrogance that ultimately led to God’s judgment there. He also spoke of his own time of rebellion in his youth, when he avoided anything to do with God. Guitarist Dennis Agajanian, who has performed for decades at events for both Graham and his late father, Billy, played at the Oregon events. 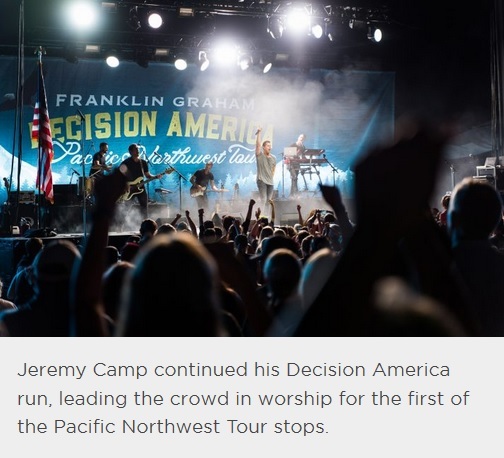 Popular contemporary Christian singer Jeremy Camp also performed in Medford and Bend, while the featured performers in Canby were The Afters. Graham’s Washington events were Aug. 7 in Richland, Aug. 9 in Spokane, Aug. 12 in Tacoma and Aug. 13 in Monroe. Of those four events, Spokane saw the biggest crowd, with 14,000 estimated. Why is the media missing this story. Huge crowd.